A lot of marketers and B2B’ers use Slideshare as another way of distributing their content that drives traffic back to their website. But if you’re a writer and specifically an author of books, did you know that Slideshare can be used, to drive sales of your book? 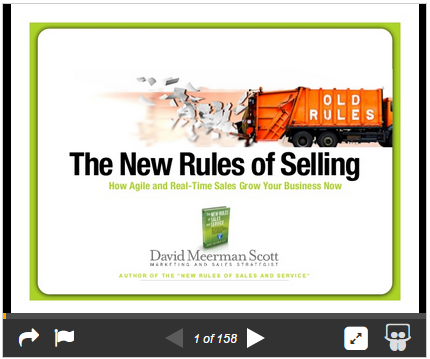 It worked for my guest on the podcast today, David Meerman Scott. David is an author of 10 books and he had this idea of using Slideshare to not necessarily promote his latest book, ‘The New Rules of Sales and Service’, but as a way of generating a conversation with his audience around the idea of his book. On the podcast today, David talks about his article published on HuffingtonPost.com titled ‘The Power of SlideShare for Generating Attention for Your Business’ and we’re featuring it today here on your ‘A Slice A Day’.